Family photos are a lot of fun to do. 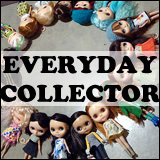 They were also a lot easier when I had less dolls and actually had a stand for every single one of my dolls. Family photos aren’t done as frequently as I’d like, and I wish I had the opportunity to do more of them (or made the time to do them more often). 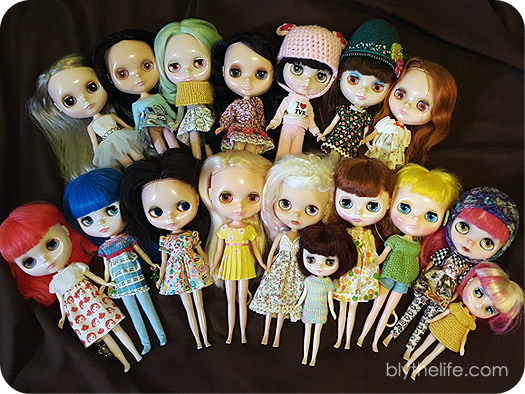 With many Blythes in my family, a group photo of this magnitude takes a while to set up and arrange. 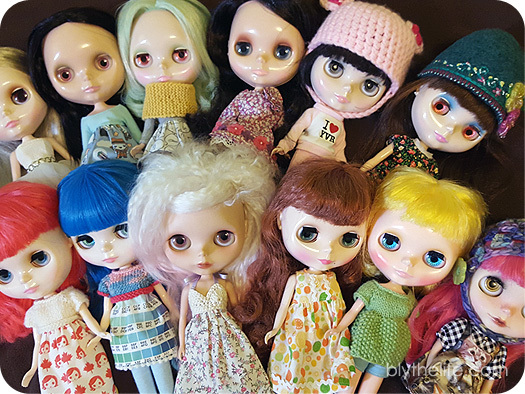 Top Row: Sophie (Cappuccino Chat, RBL), Belarus (Love Mission, EBL), Tertiary Jane (Simply Peppermint, RBL), Bennett (Margaret Meets Ladybug, EBL), Eden Mouse (Punkaholic People, RBL), Kindred (Velvet Minuet, SBL), Emmalynn (Kenner). Second Row: Moxie (Simply Bubble Boom, FBL), Molybdenum “Mollie” (Simply Sparkly Spark, FBL), Primrose “Prim” (Kenner), Lillian Rose “Lily” (Kenner), Halo (Friends With Blythe custom, Prima Dolly Saffy base RBL), Kitty Brighton (Jackie Ramone, Middie), Cedar (Monique Magnifique, RBL), Minnow (Hi-Ho! 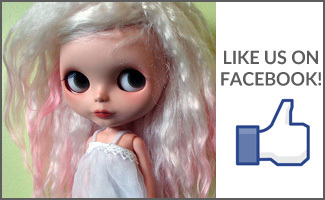 Marine, RBL+), Cameo (Friends With Blythe custom, Ichigo Heaven base RBL), Lydia Melbourne (Yellow Marshmallow, Middie). When is the last time you took a dolly family photo? Are you overdo for a new one? QOTW: How many is too many? Oh the family photos. I always want to take them but being in school I get home late at night and though of course a flash on my camera is ok, and I can also use my smartphone, I prefer to use natural light and being outside. I haven’t taken a family pic with the new girls that is thought out…but yes I am definitely due for a decent photograph of them, especially with the new (to me) vintage clothes I scored over the holidays. They are fun to photograph for sure! I don’t think I’ve ever taken a proper family photo. One that I’m eager to take is of my entire Sailor Moon Pullip doll family, but I’m waiting for the collection to be complete. 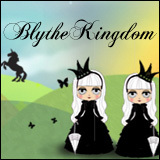 I’m a bit late to this post but I LOVE Blythe family photos and I’m soooo overdue for one!! I want to take one really badly but it’s a ton of work when you have a lot of girls 🙂 I love seeing all yours at once!